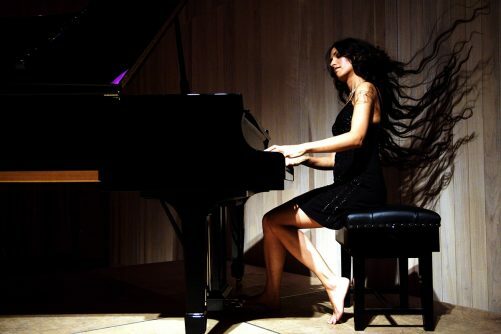 Described by the Observer as “a remarkable pianist by any standard”, pianist and composer Zoe Rahman has firmly established herself as one of the brightest stars on the contemporary jazz scene. A vibrant and highly individual artist, her style is deeply rooted in jazz yet it reflects her classical background, British/Bengali heritage and her very broad musical taste. Known for her powerful technique, wide-ranging imagination and exuberant performances, she has become a highly sought-after musician, recently working with the likes of George Mraz, Courtney Pine and Jerry Dammers’ Spatial AKA Orchestra. She is a winner of the prestigious UK Parliamentary Jazz Award, and has been nominated for the Mercury Music Prize. For this third edition of the Jazz Directors Series, Rahman is performing with the Inner City Ensemble, an evolving ten-piece group of the UK’s most promising emerging professional musicians, selected through an open call application process. The ensemble will play material written by Rahman for a Guildhall School of Music and Drama project, plus new material never previously performed live. The ensemble will include piano, double bass, drums, flute, clarinet, trumpet, alto and tenor saxophone, trombone, and tuba.